Discussion in 'Moto / Utility Jackets' started by Thomas Koehle, Jan 30, 2019. Akang ed, Tommy, Micawber and 6 others like this. Nice jacket! Looking forward to see some elevator/restroom pics... The only thing I do not like is that it has only one chest pocket - I am a symmetry type of guy. i have one of those aero hbs in black dyed over seal brown [my work]. i believe it was originally offered by thurston [i purchased it second hand],, thus, it has a little added length on the body and arms....which is something i like. if the hides used for your jacket are the same hh used for mine, you will find that the jacket "breaks in" easily, and gets comfy fast. they are nice no frills, straight forward every day wearers. btw, i swapped out the buttons for vintage colt buttons, replaced the side belts with "vintage" type tongue buckles and popped holes in the straps,, and popped rivets into the bottom front, as well as replacing the zipper puller with a m-41 talon puller. why all the to do? just to give the jacket a 30s kinda one off look. Man love the color on that . What size are you getting? Fit pics please! Good luck with it . That half belt looks like the bomb, Thomas. Is that CXL FQHH Thomas? It looks like it. Not a HB but I have an Aero Barnstormer in brown CXL FQHH and it is some of the best looking leather I've seen, it wears beautifully too and develops stunning patina. It's one of my most favourite jackets. That looks great, post some pics when it arrives tomorrow! Southoftheborder and Thomas Koehle like this. Looks really nice to me, nice Dubow style pointy collar shape! I bet it'll be comfortable to wear too. But I wish Aero would not fit those silly little zips to the CXL jackets. They might have been the size fitted on originals the jackets are based on but those originals were not made in thick hide like CXL. They were mostly made in HH similar in thickness to the hide Aero sell as jerky. Trying to do up a new jacket made in CXL with a piddly little zip sandwiched and hidden between two layers of leather and anyway not man enough to deal with such thick hide - being more likely to bend rather than slide easily into place is really no fun. As to button versions - don't get me started. You can break your fingers trying to do those up when they're new. Lovely to look at but very often a pain to wear. I've only had experience with the one, my Barnstormer and although it was very substantial when I got it (it had had two previous owners who hadn't worn it so effectively new) it has softened and moulded beautifully. It's a heavy jacket but I love wearing it and it's not annoying in the slightest, in fact it's very comfy now. I love the thing and wouldn't part with it. 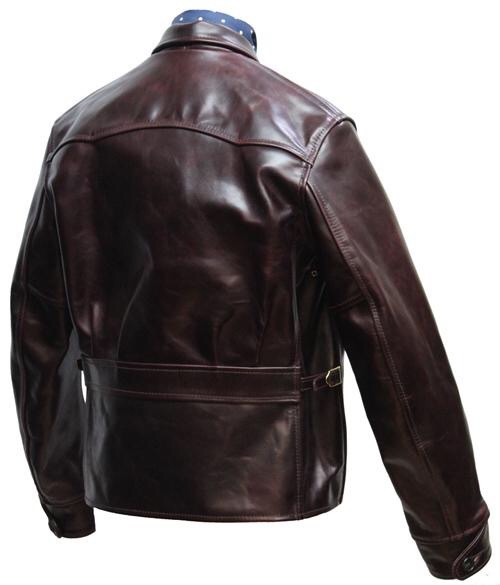 One thing I do notice here is if I wear it in close to freezing or freezing conditions, it can be initially quite stiff (I imagine that's all the waxes that Horween use in the leather) and takes about 5 minutes to "loosen" up. One of my favourite jackets, if not my favourite. Looking forward to some fit pics, I'm seriously considering something in cordovan myself, steer though. I also don't find the heavy horse or steer difficult to wear, it's lovely stuff. May I suggest one of our Hookless Grommet Zippers? I'm probably a bit jaundiced at the moment having just bought a new and unworn Aero Bootlegger from someone who clearly found it too unforgiving for him. Unlike some I'm not the sort of masochist who enjoys breaking in heavy Horween hide so I'll probably take a shortcut via the shower and that will make it a lot easier to do up. Some people buy jackets in CXL without realising just how heavy it is and quite a few move them on PDQ. I've bought more than a couple from the unwary like that myself. Careful, or the irony may enter your soul. Tommy and Smithy like this. Well received the jacket on Thursday (within 2 days after ordering and must say i‘m overwhelmed. Yeah the CXL HH is heavy and first half hour in the morning it feels kinda stiff but as soon as is warmed up it feels fine for me. I weared it all day long yesterday and it already started to slightly break in. 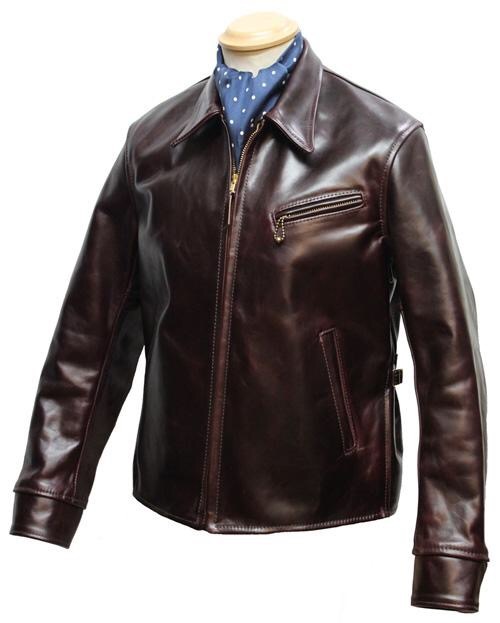 The design is splendid (although i was more after different cuffs) and if i would have ordered a custom-made one i would have changed them but i took the jacket off the „sales page“ so i decided for the advantage in price and left everything „as is“. The support i got from Aero either via email or phone was flawless. Bottom line: splendid jacket - splendid Service! Will post some fitpics asap. Ken at Aero Leather, Tommy, Smithy and 1 other person like this. tusche, bseal, watchmanjimg and 5 others like this. I now am very familiar with all the nooks and crannies of the aero half-belt. I like that jacket style. Maybe you should post pics of the jacket you worked on for Aero? That really is praise ! Sure. I didn’t want to do without your permission. I will do so in a separate thread so not to take away from this one. I really do like the half belt style now as a result. seres, Smithy, Tommy and 2 others like this. Easily my favourite non-military jacket out there.